TEACHERS unions yesterday angrily rejected the $400 million deal struck by government and the Apex Council, accusing their representative body of being compromised and working against the improvement of civil servants' conditions of service. 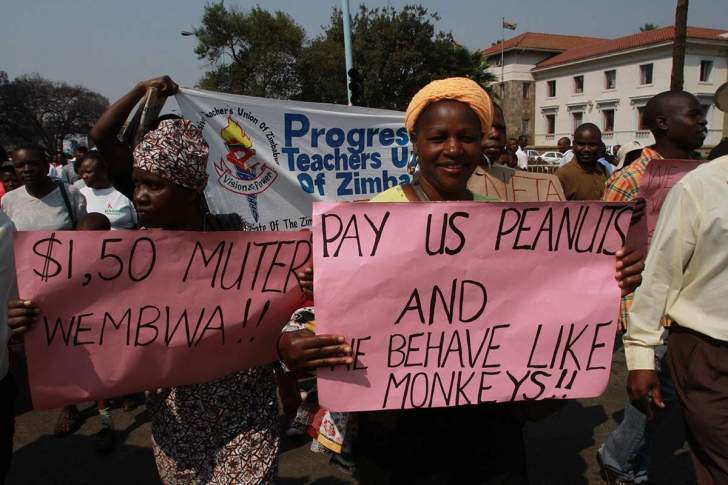 Progressive Teachers' Union of Zimbabwe (PTUZ) secretary-general Raymond Majongwe said they were not accepting the offer and their fight for better salaries would continue. "We can never be happy with that arrangement because in the first instance, when Cecilia Alexander (Apex chairperson) was presenting her arguments, they told us that they were demanding $1 700 and they end up with less than a 10th of that amount in their increment. So how then can we say I am happy?" he asked. "A lot of things that they say they agreed on are not practical. They are not clarified and quantified and their timeframe and implementation remain a mirage." Majongwe said teachers were being victimised for engaging in industrial action and that the Apex Council was compromised and cannot represent civil servants well. He said teachers want to go it alone and demand to negotiate on their own. "The real reason we are in this situation is that the Apex Council is pulling cotton over our eyes, they are not representing anyone," Majongwe said. "As far as we are concerned, this is an insult to teachers. We are not going to accept this. The PTUZ is saying no. This is pure dog food and it doesn't address the suffering of teachers. If you listen carefully, people at Apex are saying they are very happy, but how do you generate happiness when you are giving out a cushion pillow of stones. This is not a cushioning allowance." He said the duty-free car importation scheme would only breed corruption because the teachers have no capacity to buy vehicles with their current salaries. Amalgamated Rural Teachers' Union of Zimbabwe (ARTUZ) said it was disgusted by the "flawed deal" signed between government and the "illegitimate and highly-compromised Apex Council". "The deal offers a meagre US$26 salary increment to the current salary of US$120. In total, an average teacher will be earning US$146 in April 2019. This falls far short of US$1 150 needed to sustain a family of five monthly," the organisation, in a statement, said. "ARTUZ reiterates that government should simply honour our 2012 agreement and pay our current salaries in USD or equivalent." Zimbabwe Teachers' Association (Zimta) president Richard Gundane said there still existed a gap between the increased salaries and the individual budgets for individual civil servants. They have, however, accepted the government offer for the sake of moving forward. "What is important is to monitor the gap between the new salaries and individual budget for a person. It is that gap that we should continue to pursue. We made this concession with the view that by June we will have an opportunity for it to be reviewed," he said. Alexander said it was unfair for PTUZ to undermine the Apex Council's efforts despite that there was no contribution coming from the organisation. She insisted that they had done their best under the present circumstances to bring something on the table for civil servants. The council secretary David Dzatsunga hit back at the teachers' unions, saying they went on a different path to embark on a strike that did not produce anything, hence it would be unfair for them to dismiss their efforts that brought the $400 million package. "That is false and those allegations are unfounded and are not premised on any substantial and substantive reasons that I could then respond to," Dzatsunga said. "We just negotiated as much as we could under the circumstances and some unions went as far as meeting the President [Emmerson Mnangagwa] and they brought nothing. They went on strike and brought nothing. Therefore, they cannot turn around and accuse us of being compromised. That is unfounded."